Dayton, Ohio's Trial Balloon follows up last year's "Fool One Another" (reviewed last issue) with more of the band's variations on psychedelia and full blown acid rock. While "Fool One Another" had Pink Floyd and bluesy influences, "Ice" features much heavier metallic acid guitar and some good old rockin' flash from ax-meister Alex Sator. Sator plays guitar, bass, keyboards, and vocals, and wrote all the songs, Layne Loxley plays drums, keyboards, and vocals, and Buzz Pitman contributes vocals. The album opens and closes on a light note with the opening track, "To Dayton With Love", serving as a light romantic guitar intro. And "Are You Happy" is an acoustic guitar piece that bids farewell. In between is plenty of shredding and rocking that should endear Trial Balloon to all fans of heavy rockin' psychedelia. "Small" and "Crybabies" are great rockin' psych songs with a bit of a pop edge. On "Small" the vocals and the song itself sound like Simple Minds but the music is chainsaw guitar psych. It's got a catchy pop feel but the music is mucho crunchy. "Crybabies" is similar with its freakout metallic psych guitar but rather than the Simple Minds comparison I was reminded of the Stooges. These tunes are HOT and are my runaway favorites on the disc. "Home" is a short looped guitar psych tune, and "Demons" is a floating psych tune with multiple electric and acoustic guitars. The title track is an 18 minute extended guitar jam that along with the rest of this disc features Sator's varied guitar interests. The pounding tribal drums are very much in the forefront while Sator's guitar jams along. I hear Pink Floyd-ish soloing but Sator adds some fiery guitar shred to the mix. I also hear some Crimson-like rhythms circa Thrak but with Sator playing blazing solos along with it. The bands 1998 release "Fool One Another" featured Sator's various guitar personalities and on "Ice" we hear more of his psychedelic trip guitar but with considerably more flash. Great stuff. But this isn't just a chance to show off as we hear lots of cool sounds and some funky bass. The last minutes of the song wind down on a quiet note to ease the listener into dreamland after the lengthy paisley headbangin' ride. I'm having a hard time deciding whether I like Ice or Fool One Another better as both albums seem necessary to give an overall idea of what this band's music is all about. Stylistically varied, but still coherent. Fans of heavier trip-rockin' psych will probably want to start with Ice. 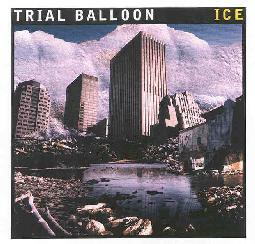 Available from the Trial Balloon page at CDbaby.com.